In the 1970's, Our founder Prof. Wong began developing his own original method "Natural Whole Wood Log Cultivation" for cultivating premium grade Ganoderma mushrooms in a natural organic environment without the use of harmful chemicals and pesticides. Jiangyou is the hometown of the famous ancient Chinese port Li Bai. Its longitude is East 104˚31'- 105˚17' and latitude North 31˚32'- 32˚19'. There’re many interests including Chinese key cultural relic protection sites – Mt. Douwei, Temple Yunyan, Sword Door and Road Shu. This is a door leading to mythical world “Nine Villages” and the fairyland “Yellow Dragon Temple”. The plantation has a subtropical humid monsoon climate. The average sunshine time is 1367 hours per year and annual rain is 1100mm, with a relative humidity 80%. The mountain belongs to Dragon Door System. Its altitude is about 600 meters and the average temperature is 16˚C. The seasons are very clear and the temperature changes a lot from daytime to night. The weather here is suitable for growing Lingzhi. There’re lots of wild natural Lingzhi in the forest around the plantation area in summer and autumn. (1) The top cover of Lingzhi stops growing bigger. (3) Many Lingzhi spores fly out. (4) Under the top cover the colour is even. Therefore, the Lingzhi picked and sorted under the GAP standard are particularly with good quality. Contracted by the GMP standard and highly concentrated, Concord Sunchih products will be absorbed most effectively and will bring health to everybody. 4. What is Cordyceps Cs-4? The wild harvested mushrooms are still relatively scarce and very expensive, and the process of harvesting the wild fruit bodies in the Himalayan highlands can be environmentally damaging - so modern use and research has focused on hot water/alcohol extracts of the Cs-4 strain of mycelium cultivated in liquid culture (then extracted, dehydrated to a powder and encapsulated). The Cs-4 strain of mycelium is the only strain of Cordyceps mycelium that provides all the active compounds found in the wild harvested Cordyceps mushrooms. 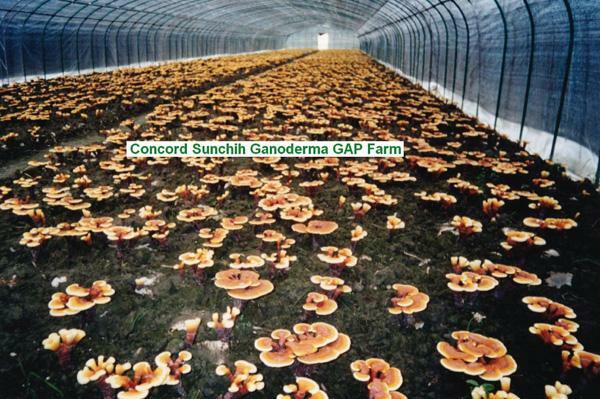 Concord combine wild harvested Cordyceps and extracts of the Cs-4 into one Concord Vita-cordy capsule.